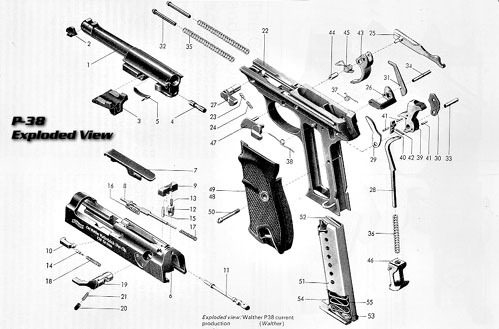 Immediately before World War II, Walther moved further into the field of 9mm parabellum firearms by the introduction of a model HP and in 1937 the Heeres Pistole or service pistol was presented to the German officials. 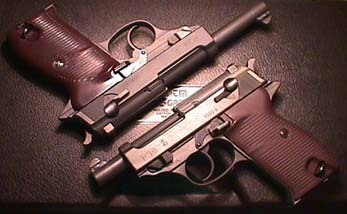 Finally in 1938 a modified HP was adopted by the military staff, along with the Luger, as the standard service sidearm and designated the P38 (pistol Model 1938). 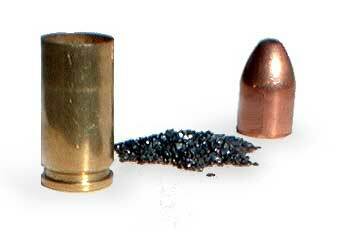 Test models of the HP were built in the caliber .38 ACP and .45 ACP for the American market and, in fact a commercial 9mm HP was marketed by Stoeger Arms of New York in 1939. The P38 was adopted by the Arm in 1938. 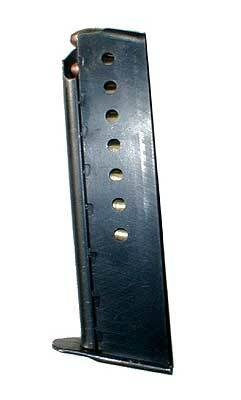 The main differences between it and the HP are, apart from the markings on the slide, the checkered wooden grips, the rectangular firing pin and a concealed extractor, making parts non-interchangeable. There were also a number of minor changes made in the P38 during its development. 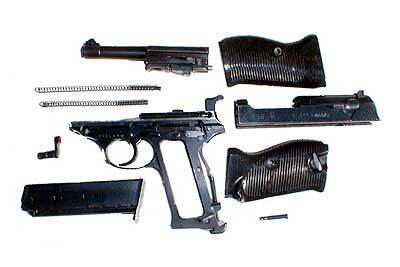 The first series of Walther P38s during the war had serial numbers beginning with an 0 and the first 1,500 of which have the rectangular firing pin of the HP. There would seem to have been three types of markings during the development on the basic gun, namely HP, P38, and Model P38. 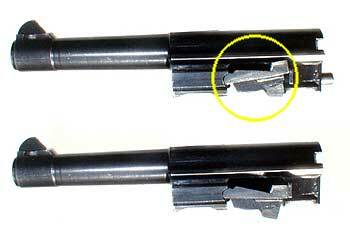 The HP and the Model P38 have German commercial proof marks and are rare. The proof mark was probably used for export or for police units. 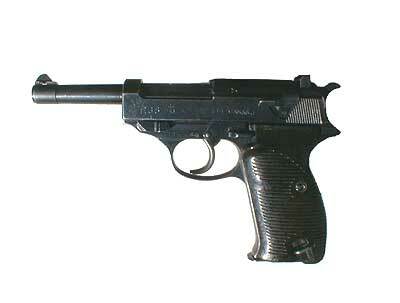 Also evident, as on other wartime produced German weapons, were the manufacturers' code numbers. 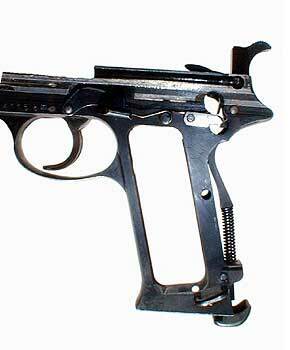 The P38 was manufactured by Walther, Mauser and Spreewerk. The codes used on the weapons to conceal the producer's from the allies were as follows: Mauser bfy, svw; Walther 480, ac; and Spreewerk cyq. As previously mentioned there were a number of Walthers built which do not come into the general production runs. One of these guns was not even assembled. 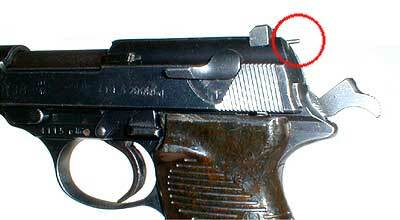 This was a version of the P38 manufactured by FN. No completed guns are known but the allied forces captured a large number of receivers and slides when they moved into Belgium. One important warning, apart from the usual remarks regarding wartime production, is that the P38 can be assembled and fired without the locking block. This means that the weapon functions as a blowback one and consequently serious damage will occur as well as the obvious danger. Production of the P38 stopped in 1945 and was resumed in 1957 for the Bundeswehr. 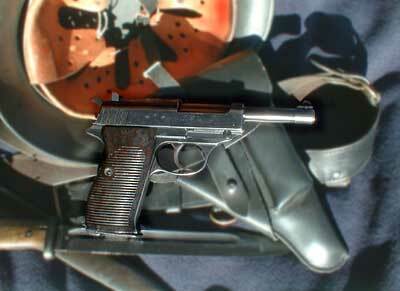 A parallel prewar development was a hammerless version which was called the Armeepistole. 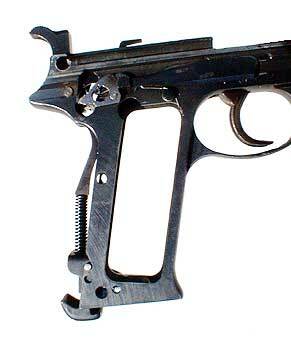 This weapon was not produced in quantity as the German Command chose the P38; Walther stopped development and production of the Armeepistole to concentrate on the P38. 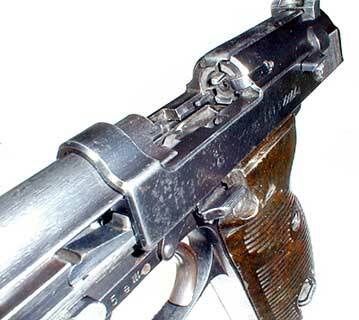 The Armeepistole was made with light alloy components, long barrels and even shoulder stocks during its development. When the post-war production of the P38 was resumed the weapon was made with very few modifications, although it must be noted that many post-war parts cannot be interchanged with those of the wartime production because of slight dimensional changes.